The headlines today might be hogged by the foreclosure of Harry Crosbie’s loans and receivers appointed to a range of property including the Point Village shopping centre and the Grand Canal Theatre, but this afternoon’s Iris Oifigiuil confirms that NAMA has had receivers appointed to a lesser known company, Melbourn Inns Limited. On 12th April, 2013 NAMA had George Maloney of Baker Tilly Ryan Glennon appointed as receiver to certain unspecified assets at Melbourn. The directors of Melbourn Inn Limited are Barry O’Connor (47), Robert Kennedy (50) and Anthony O’Leary (57). The company is 100% owned by Clayview International Limited which is one-third owned by each of the three directors. The Bank of Ireland CEO Richie Boucher has been in the news a lot recently. Back in the mid 2000s he was bessie mates with Sean Dunne and was one of the main lenders to the Baron of Ballsbridge for what have now turned out to be disastrous projects. These days, Richie is the highest paid CEO at a bank in which the State has shares – we own 15% of the ordinary shares of Bank of Ireland and in addition own €1.5bn of preference shares; in 2012 Richie was paid a salary of €690,000 plus pension contributions of €186,000 plus perks of €34,000; Richie handed back €67,000 of his salary as a waiver. The chairman of Bank of Ireland or “Governor” is Archie Kane, formerly of British bank HBOS which was recently slammed by a recent report by the British parliament and Archie was paid €209,000 for six months in the role as chairman and picked up €31,000 extra in “consultancy fees” and €22,000 in perks. 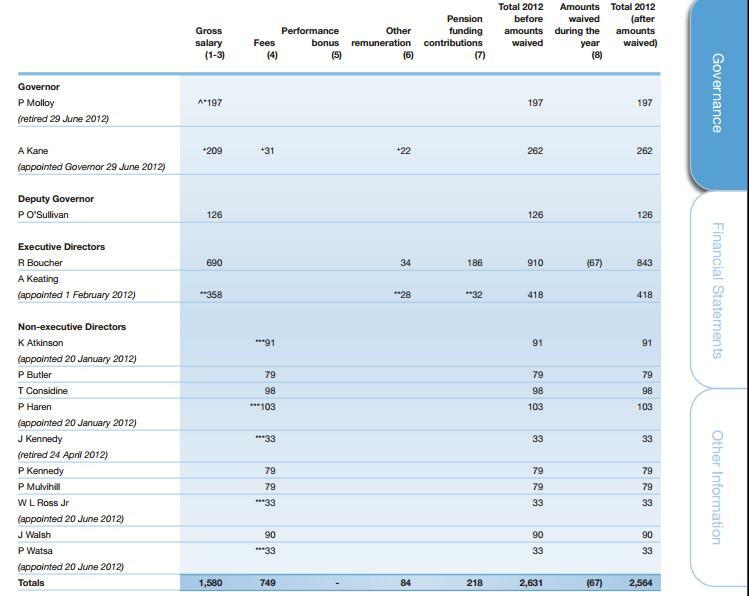 Bank of Ireland made a comprehensive loss of €1.5bn in 2012. Minister Noonan has been intensively challenged by the Opposition over bankers’ pay, he responded by commissioning a report last June which allowed him deflect questions for nearly nine months. When the Mercer report was finally published in March 2013, Minister Noonan said he was looking for 6-10% savings in remuneration costs at the banks in which the State has an interest. 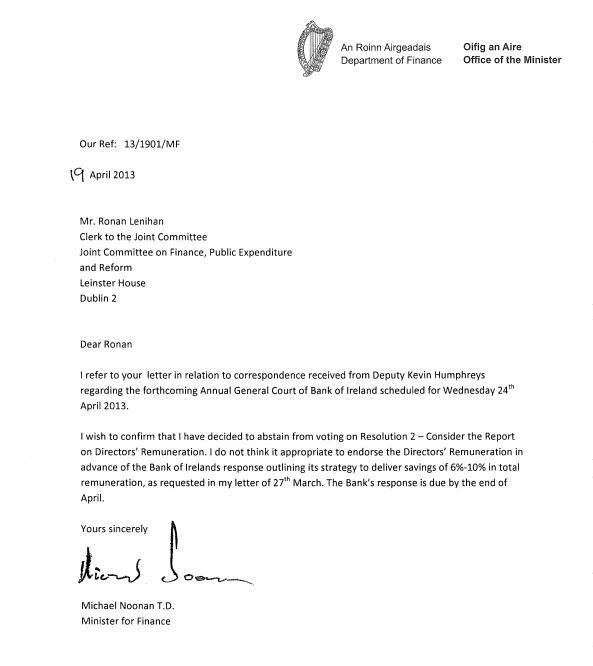 On 24th April, 2013 Bank of Ireland is holding its annual general meeting or “Annual Court” and Minister Noonan has been harried by the Opposition, notably by Deputy Shane Ross but also by others, to confirm whether he will vote in support of the existing remuneration for top management. This morning we finally got an answer. In response to a written question from Labour’s Kevin Humphreys at the Oireachtas finance committee, Minister Noonan has this morning confirmed that he will abstain from using his 15% stake in Bank of Ireland to vote in favour or against the remuneration of Bank of Ireland’s board. Union members who have had, and possibly still have, the threat of 7% pay cuts hanging over their heads may be scratching those same heads at the Minister’s treatment of Bank of Ireland remuneration. News from the Daily Business Post this morning that NAMA has had receivers appointed to assets controlled by developer and impresario, Harry Crosbie. In an “exclusive”, Ian Kehoe reports that Stephen Tennant and Paul McCann of Grant Thornton have been appointed to a range of assets including two landmark assets in Dublin’s docklands area – the Point Village on the north bank and the Grand Canal Theatre in the south docklands. The DBP claims that Harry Crosbie owes NAMA €450m. The Point Village shopping centre next door to the O2 has been suffering for some time, with a falling-out with Dunnes Stores which has meant the shopping centre looks distinctly deserted. It should be stressed that the O2 is not affected by the receivership. Harry is one of NAMA’s higher profile developers and is probably in the Top 40. Apart from developing many schemes in Dublin, he is a promoter of events and indeed received a pair of golden cufflinks (are ye listening there NAMA) from Queen Elizabeth after organizing the reception in the Treasury Holdings-developed convention centre. Two years ago, Harry was expressing optimism of working with NAMA, paying off as much as he could over a four-year period before waving goodbye to NAMA. Looks like that plan hasn’t worked out. UPDATE: 20th April, 2013. Without citing sources, the Irish Times today claims that NAMA is poised to take control of Harry’s 50% in the O2 concert venue “next week”. The other 50% is said by the IT to be owned by Live Nation, the international events company. The IT reports that Harry owes NAMA €500m, split evenly between personal and corporate borrowings. Although many of the loans are non-recourse, some have a personal liability element. Minister Noonan says that banks are proposing 400 sustainable mortgage solutions per working day – riiiiiight. Cast your minds back in August 2011 and you might recall economist Morgan Kelly’s last contribution in the old Irish media when he warned of the growing mortgage crisis. The knee-jerk reaction was the announcement, out of nowhere, of the Keane working group which delivered a report in October 2011 which has gather dust ever since. At the time, the Government declined to provide details about the Keane working group, its terms of reference, budget, resources, objectives, time frames or deliverables. That episode strongly suggested the government was caught on the hop and that it was not in control. Fast forward to March 2013 and Minister for Finance Michael Noonan makes fanfare announcement in which he outlines targets for banks providing sustainable solutions to mortgage borrowers in distress. No, the Minister would not tell us what a “sustainable solution” was nor who would judge if a solution was sustainable or not, but the Minister did trumpet targets and the first target is that 20% of mortgages in arrears would be offered sustainable mortgage solutions by June 2013. In the Dail this week, Minister Noonan was challenged about this target. Given that Minister Noonan had previously said that distressed mortgages were defined as those in arrears of more than 90 days, the Sinn Fein finance spokesperson Pearse Doherty asked the Minister if – by reference to the latest arrears figures for the three months ending 31st December 2012 which showed approximately 125,000 buy to let and owner occupier mortgages in arrears over 90 days – was the Minister really saying that 25,000 mortgage borrowers would be offered “sustainable solutions” by June 2013 which equates to 2,000 mortgages per week or 400 per working day. The Minister was asked if these targets would be constantly monitored so that we don’t reach June and find out the targets are Alice-in-Wonderland. The Minister responded “the Central Bank has informed me that, while demanding, the level of the targets have been calibrated taking account of the current operational capability of the banks’ arrears management.” So the Minister who was goal-hanging the notion that this Government was finally doing something about the mortgage arrears crisis in March 2013 is now passing the parcel to the Central Bank. Does anyone really believe our banks are carefully examining the mortgage status and finance of borrowers and proposing 400 “sustainable solutions” every working day? We’ll find out in June, but the betting on here is that we will be lucky to have 400 “sustainable solutions” per week. The full parliamentary question and response is here. Deputy Pearse Doherty: To ask the Minister for Finance further to Parliamentary Question 194 of 26 March 2013, in which he stated that banks have been given targets of proposing sustainable mortgage solutions to 20% of mortgage loans that are 90 days in arrears by 30 June 2013, and that this would equate to 20% of 94,488 PDH and 28,421 BTL loans by reference to arrears at 31 December 2012, his views on whether it is feasible that banks can propose solutions to 25,000 mortgage accounts in the forthcoming three months, equivalent to 2,000 per week or 400 per working day; and if the Central Bank of Ireland will be monitoring progress on reaching targets on an ongoing basis..
Minister for Finance, Michael Noonan: The Deputy refers to the targets set by the Central Bank which require the main lenders to systematically work through their mortgage book to offer durable solutions to mortgage holders covering arrears cases that are 90 days or more overdue. § Targets regarding subsequent performance of these solutions will be set. The Central Bank has informed me that, while demanding, the level of the targets have been calibrated taking account of the current operational capability of the banks’ arrears management. The banks will be required to publish their performance against the targets and make quarterly reports to the Central Bank. The Central Bank will consider each bank’s performance against the targets, including assessing whether the modifications provided are in fact sustainable solutions.